Newcastle will be turning blonde as a north-east theatre company takes to the stage with the region’s amateur premiere of the smash-hit musical Legally Blonde. 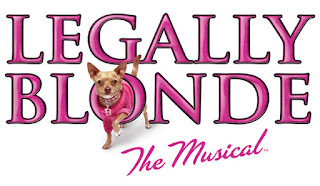 West End Musical Theatre Company will be performing the musical based on the popular film, which tells the story of Elle Woods as she makes her way from sorority sister to legal high-flyer. Elle makes the move to Harvard Law School once she realises her boyfriend is dumping her for someone more ‘serious’. Elle, played by Cheryl Moody, even considers turning brunette but is dissuaded by beautician Paulette, played by Nicola Hewett. The cast of north-east performers will be entertaining audiences all week from Tuesday 24th –Saturday 28th November at Newcastle’s Tyne Theatre & Opera House and the show even features two dogs – a chihuahua named Chi-Chi, who plays the role of Elle’s pal Bruiser and a bulldog called Patsy who plays Rufus, Paulette’s canine friend. Cheryl, who works as cabin crew for Thomas Cook airlines already had the flowing blonde locks needed for the part and the similarities don’t end there. She added “I love playing Elle and to be honest, I don’t find it too difficult. I am a very girly girl, I own a chihuahua, I love pink and I have been known to be a bit dizzy at times!” As the lead role, Cheryl also gets to perform great numbers such as ‘Take it Like a Man’, ‘So Much Better’ and ‘Legally Blonde’. Elle’s love interests are Warner, played by Kevin Rhodes and Emmett, played by Alex Easten. Elle is advised to follow her heart when it comes to love in Paulette’s powerful, moving and funny song ‘Ireland’.